Traditional narratives demand closure. In other words, conventional story-telling requires a satisfying ending. In literature, we call this the denouement, the conclusion that ties loose ends together and leaves the reader with a feeling of completion. Texts often experiment with narrative form, of course, playing with what an audience expects or denying it to achieve artistic, narrative, or political effect. A film might resist chronological order to reflect its protagonist’s state of mind (e.g. Memento, 2000), for example, or break the fourth wall by having a character directly address the audience (e.g. Ferris Bueller’s Day Off, 1986). Additionally, the story halts mid-film for a “race rant,” in which characters from the film appear as talking heads to attack other ethnic groups, invoking offensive stereotypes and barking slurs directly into the camera. Halting the narrative in this way encourages viewers to recognize and attend the racism we have been seeing and will experience throughout the film. While this is a potent scene and filmmaking strategy, defying closure can be an even more powerful method of raising consciousness, so programmed are we to expect a satisfying ending. 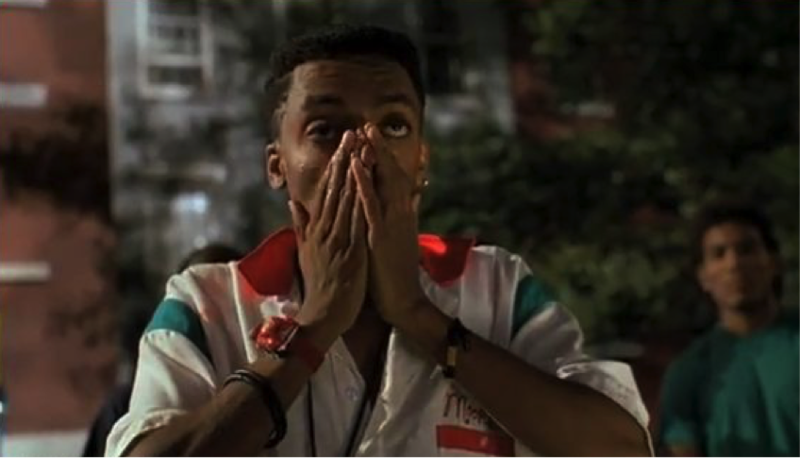 Do the Right Thing offers an ambiguous and unsatisfying conclusion that directs viewers to consider the unchanging state of racism in contemporary America. A yearning for closure explains some critics’ oppositional readings of the ending of Do the Right Thing. All agree that the burning and looting of Sal’s Pizzeria is the climax of the film, in which racial tensions erupt during a hot day in a poor black New York City neighborhood. There is some controversy over Mookie’s (Spike Lee) motives in throwing the trash can through the window of Sal’s and starting the riot. Is Mookie advocating retaliatory violence for the murder of Radio Raheem (Bill Nunn), distracting the crowd to save the life of Sal (Danny Aiello) and his sons, or both? Close attention to Mookie’s expression and gestures points to fear and exasperation, and we see no rage as he throws the can and walks away, raising his arms in mock triumph. The film does not end with this climax, however, and the question of Mookie’s culpability permeates the final scene, which takes place the next morning. Mookie approaches Sal to discuss his previous week’s pay. They argue over Mookie’s responsibility for the destruction of the restaurant and whether Sal owes Mookie anything. Mookie reminds Sal that he’ll get insurance to rebuild. Eventually, Sal crumples up $500 in cash and throws it at Mookie, one bill at a time. Mookie picks it up after it bounces off of his chest and tosses back everything over his $250 salary. He then exits the film, heading over to visit his girlfriend Tina (Rosie Perez) and their child. If we argue that Mookie did save Sal and his sons from the violence of the crowd the night before, that Sal will indeed be able to replace if not restore his pizzeria, and that Mookie has the salary he earned, there is still much work to be done to interpret the film’s multifaceted ending. Were the film to end as Mookie walks off, we might think: perhaps things will change on this street. The destruction of Sal’s was symbolic, displaying the distance between the white “haves” and the black “have nots” (with the Korean immigrants somewhere between the two). Catharsis has occurred, through which the audience - and possibly the characters - may learn. Such conclusions do not satisfy, however. Mookie is now out of a job and, even if he gets his delivery gig back once Sal rebuilds, nothing else has changed. Mookie has no better prospects, and the violence in which he took part validates a racist perspective that poor blacks are dangerous and apt to erupt at any time. This is exactly the perspective that led to Radio Raheem’s death. Equally importantly, the film does not end when Mookie walks off. 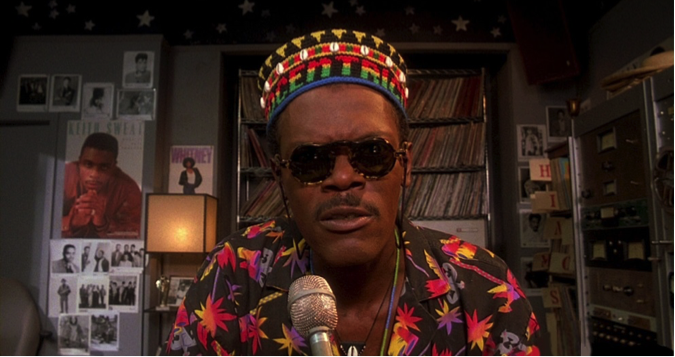 This scene is followed by DJ Mister Señor Love Daddy (Samuel L. Jackson) reminding the neighborhood from his storefront radio station that it’s going to be another hot day. This is not growth, or even change, from the day before. The unrelenting heat that makes so many black lives hopeless isn’t stopping. All we saw was one typical day with an atypical outbreak. And even this isn’t the final moment or message. Spike Lee concludes Do the Right Thing with two scrolling quotations accompanied by soft jazz, one from Martin Luther King, Jr. advocating peaceful protest and the other from Malcolm X advocating violence as self-defense. 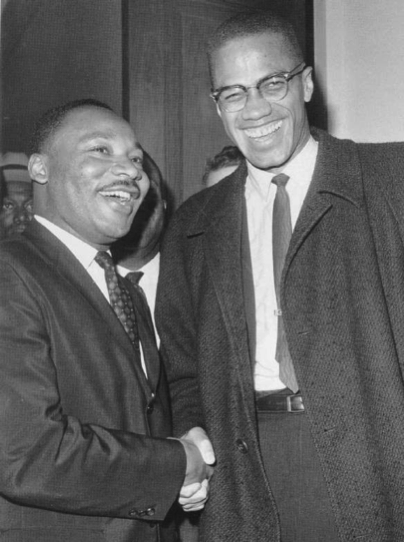 The contradictory pair of quotations gives way to a photo of the two Civil Rights leaders shaking hands, the very image Smiley (Roger Guenveur Smith) sells on the street. This extended ending is no simple denouement. Its content and rejection of traditional closure argue that there are no simple answers for improving the conditions under which too many African Americans live, and neither turning the other cheek nor striking back has solved the continuing crime and tragedy of American racism. While it is easy for Da Mayor (Ossie Davis) to tell Mookie to “do the right thing,” no one really knows what that is, not even Da Mayor himself, a lonely drunk who, along with Mother Sister (Ruby Dee), has seen all that the Civil Rights movement attempted to accomplish but could not achieve against a white-supremacist America Dream. To end with true resolution - either the complete extinguishment of hope or its optimistic attainment - would lessen the impact and importance of this film event. After Do the Right Thing was released, it would be only a matter of months before Rodney King would be brutally beaten by members of the LAPD, sparking the LA riots of 1991. Even today, in the era of #blacklivesmatter, the film retains its power. As Roger Ebert wrote about his experience of seeing Do the Right Thing in May 1989, “Most movies remain up there on the screen. Only a few penetrate your soul.” Do the Right Thing has such penetrative power because it portrays its realities without drawing conclusions for the viewer. In cinematic terms, its skillfully handled resistance to traditional narrative closure is a central reason for its commanding and long-lived impact.